You are here: Home / Featured / A Dave At C2E2: Comic Book Herald’s Long Con! A Dave At C2E2: Comic Book Herald’s Long Con! As much as I love comics, I’d be lying if I pretended comic cons didn’t make me nervous. People always make me nervous, and enormous swaths of people I don’t know make me especially nervous. You’ll never believe this but C2E2, now in its 10th year as Chicago’s biggest comics and entertainment convention, is full of a lot of people. Lots and lots of people! Despite this, I had a marvelous C2E2 2019, for the first time attending with full press privileges (see also: I got a different badge, got to seek some peace and quiet in a private room, and had a Monster Energy rep comp me a free coffee). Did I get egregiously sweaty and nervous trying to figure out things like “where’s the press lounge,” “do I just walk up to Jonathan Hickman and ask him to sign a copy of Secret Wars #1,” and “am I really about to defend Marvel’s Rhino on a live panel podcast?” Of course! But looking back, the things that made me the most nervous are also the things I’m happiest I went through with. It’s amazing how often that’s the case! Personal con anxiety aside, I’ve detailed my observations from various panels below, as well as lightning-round creator interviews I did throughout Artist’s Alley. Before I get into them I would like to point out Comic Book Herald has an excellent piece recently from seasoned con-goer John Galati on “how to enjoy a comic con for beginners.” As a newcomer myself, I found this insightful and humorous, and recommend you give it a look if you’re considering attending in the near future! There wasn’t a ton to this early Friday panel, but it was cool to see longtime Thor collaborators Jason Aaron, Russell Dauterman, and Matt Wilson (together in person for the very first time) talk about their comics creation process. Dauterman and Wilson’s thoughtful approach to layouts, color, and integrating the Thor title into covers was all genuinely cool to hear directly. Their passion for art helps explain why Mighty Thor (the Jane Foster era in particular) was so visually stunning. It was a similar thrill to see Aaron’s script prescribe a 3 panel page, and Dauterman interpreting that as two panels, one of which is action locked within a sound effect (via the on screen War of the Realms interior art preview). I always wonder if those sorts of layout flourishes are artistic liberties or planning by the writer, and in this case it was pretty wild to see Dauterman find a way to integrate a word balloon from an off-panel character into the sound effect. A definite highlight (despite a staggering blow to my ego) came when I volunteered to defend one of 16 Spider-Man villains in the This Week in Marvel show’s NCAA style tourney. The tourney was hosted by Ryan Penagos, with volunteers paired with either Amazing Spider-Man writer Nick Spencer, or artist Humberto Ramos. Editor-in-Chief CB Cebulski revealed a referee shirt underneath his jacket to play the role of judge. Before going on panel, I was given the choice between representing Rhino or Kangaroo, and given that I love one of those characters and literally had to look up the other, I went Rhino. This turned out to be a mistake when, despite all the My Marvelous Year experience I could muster describing Rhino’s first appearance in Amazing Spider-Man #41 from memory, Marvel Editor-in-Chief sided with Kangaroo! Apparently Nick Spencer’s argument that Kangaroo “has an adorable costume” was more than enough to triumph over my amazement at Rhino’s ability to run from Mexico to New York City just to battle Spidey. 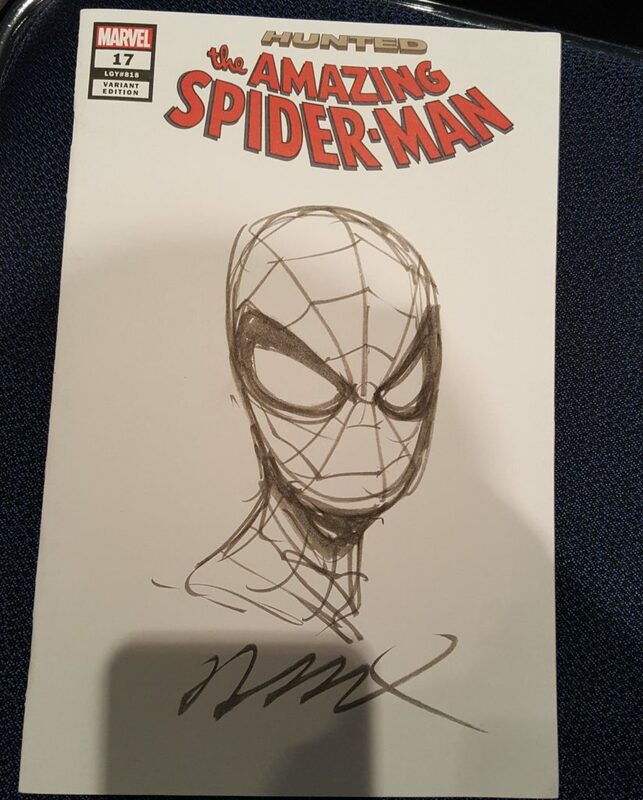 I still feel like Virginia losing to a sixteen seed in the 2018 NCAA tourney, but I did at least get a sweet Humberto Ramos sketch cover to Amazing Spider-Man #17 as a consolation prize. I definitely do *not* know the 10 realms by memory. If I had known, I could have gotten an advance read of War of the Realms #1! Jason Aaron spoke about the original Stan Lee and Jack Kirby Mangog vs. Thor story as his spiritual inspiration for the run. I had to look this up, but this likely means Thor #154 to #157. It sounds like the Avengers “lead-in” issues are a fairly minor part of the War of the Realms narrative. As I’ve been keeping up with the book, I’ve been trying to figure out how it will tie-in, and the general “need” to keep up with Avengers prior to the event. My read at this time is it will be minor. Conan is *not* a part of the event. I am feeling just fine about that. This is the “Beginning of the End” of Jason Aaron’s Thor run. The next day it was announced Aaron’s next project will be a Valkyrie title, so he’s not done with the Asgardians yet, but we’re getting close. Hot damn this was fun. It’s both sensible and genuinely disappointing that Into the Badlands is coming to a close. On one hand, it’s good for stories to have relatively tight, defined endings. Too many good TV shows have suffered simply because they stuck around too long (what’s up Dexter, Walking Dead, and LOST). Nonetheless, Into the Badlands doesn’t seem to have really reached the level of cultural awareness that I think the series deserves. It’s not hard to imagine Into the Badlands maintaining a convention circuit level of “fan popularity” a la a series like Firefly. As far as the actual premiere episode, Nick Frost *really* stood out in the premiere, both for humor and action (truly, even more than usual). I’m all in on the East of West or Lazarus style world-building in this show, and highly recommend you give it some binge consideration on Netflix if you’re unfamiliar. 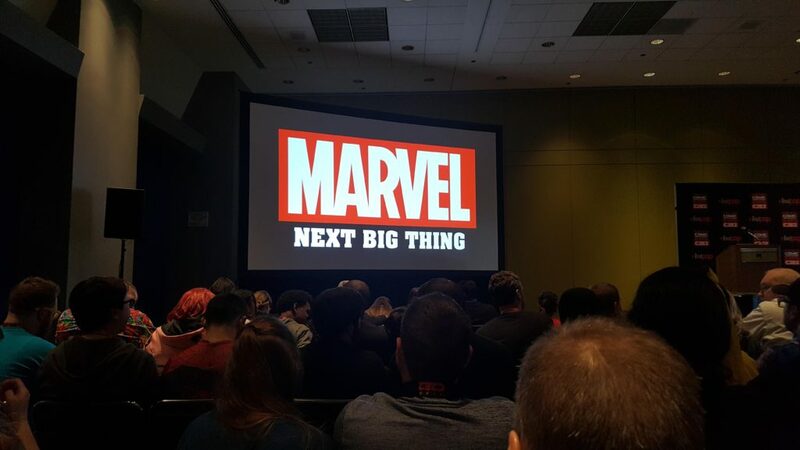 The panel I was most excited about, bar none, primarily due to the promise of announcing writer Jonathan Hickman’s role with Marvel in 2019. 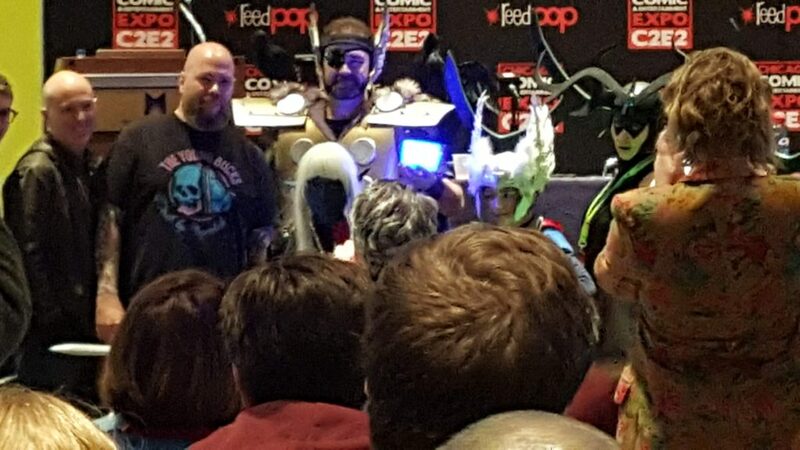 Perhaps unsurprisingly, this was also the most notably full comics panel of the entire C2E2, with the pre-panel line extending into a nebulous realm of “wait, what line am I in?” territory. As much as history tells us to be cautious of Marvel events, I am genuinely excited for the entire outlined Marvel slate, with War of the Realms in April 2019, Hickman’s X-Men in July 2019 (he’ll be writing two inter-locked six issue series, titled “House of X” and “Power of X”), and Donny Cates and Ryan Stegman on Absolute Carnage in August 2019. All of these announcements have pre-established good will that suggests these stories will be 1) good 2) a part of something I *know* I already like. Writers Donny Cates and Tom Taylor have expressed a desire on Twitter lately to reboot the Ultimate Universe, which has been destroyed since 2015. If you were going to bring back the Ultimate Universe, how would you do it? I’ve been pleased to see the following day’s comics news cycle include multiple variations of Marvel’s nebulous plans for the Ultimate Universe, and to know that this is a pot I have stirred. The Doctor Who spectacular (aka a 1×1 with my favorite Doctor / Purple Man/ Broadchurch sad male lead) was the biggest crowd I saw the entire weekend for an event. Even arriving half an hour early for the event, I was told there was no room in the inn. I asked if press was allowed in, and turns out that only *exclusive* pre-arranged members of the esteemed press fit that bill. So I just kept asking staff and crew if they could accommodate one more member of the press until, after about 15 minutes, they let me take a spot in the very back! It was well worth the effort, as David Tennant brought a Monstrous(R) level of energy and charm to the stage, to the point that I smiled and laughed for approximately 1 hour uninterrupted. As you’d imagine much of the immensely interesting conversation centered around the Doctor, but I was particularly interested in a couple of comics nuggets. The first was that David Tennant’s podcast (iTunes, Spotify, available wherever you get your podcasts) is featuring an interview with Krysten Ritter scheduled to drop on 3/26. I will 100% be listening to this to hear the Purple Man and Jessica Jones talk about what it’s like to share such a savage on screen relationship. Comic Book Herald Makes Friends! My favorite thing about C2E2 though, was jumping a little out of my comfort zone (ok, social anxiety considered, a *lot* out of my comfort zone) and talking to comics people! Rather than just swoon over their work right on the floor, I tried to ask each creator I talked to what they’d pick as a recommended read for new comic book fans. The below are all the answers I got along the way, including two comics I now have vowed to read myself! Kenneth Rocafort: Todd McFarlane on Amazing Spider-Man, specifically referencing the Omnibus edition . Jason Howard: “Super Dinosaur,” his all ages book with writer Robert Kirkman (Walking Dead). Daniel Warren-Johnson: “Locke & Key” (with a nod to “Kaijumax”). 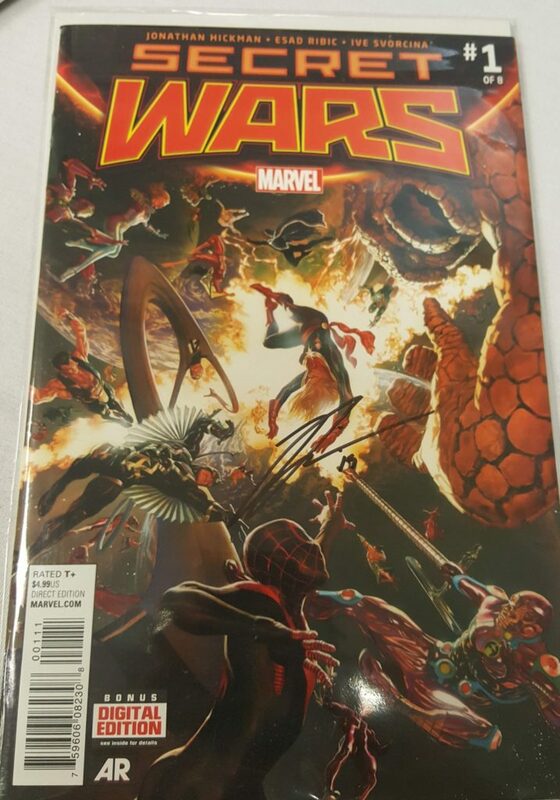 Also a huge shoutout to Jam Comics’ Jon Aramis, who hooked me up with a copy of Secret Wars #8 (the only issue missing from my run) signed by Mike Zeck! The absolute highlight of the con for me, though, was the 5 to 10 minute conversation I got to have with comics mastermind Jonathan Hickman (which included him signing a copy of my Secret Wars #1!). Following the David Tennant panel, I made my way to the 5th floor of the convention center entirely to circumvent the hordes. As I passed the final “500” level room before walking down a floor, I glanced into a room and recognized Hickman from his appearance the day before at Marvel’s “Next Big Thing.” He was having a coffee to himself, and probably enjoying a moment of peace of quiet. I noticed a sign next to the door that specified the room was available exclusively to VIP ticket holders. But surely such regulation don’t apply to a member of the free press! I walked past the room for about 20 seconds before mustering the courage to walk in and just try to talk to Hickman. It worked! I kicked off by awkwardly explaining I had an entire reading order on Comic Book Herald just for his work at Marvel (“All on one page?” he asked, politely but obviously skeptical), made a weird joke about being the guy to plant seeds of misdirection in guides to his work if he was so inclined (what the hell, Dave? ), and then eased in to my stock question about his go-to “on ramp” entry points. In professional journalist fashion, I was so excited by the experience that I didn’t ask him a single question about the X-Men. That said, I’m not sure I can emphasize enough how much Hickman seems to love and respect Morrison’s work at Marvel. I fully expect everything from Marvel Boy to New X-Men to heavily inspire much of what’s to come in House of X and Powers of X. There you have it, the tale of my first full weekend at a comic con, and first time attending under the Comic Book Herald banner. It was a blast, so a big thanks to everybody I hung out with that made it that way!